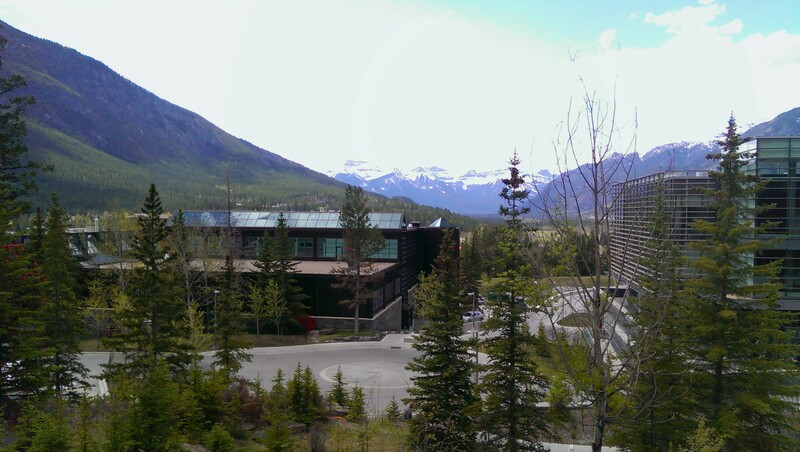 I spent the last three weeks at the Banff Centre, Alberta, Canada for Distributed Intimacies, where twenty-something scholars and artists have removed themselves to the mountains for some writing, talking, hiking, canoeing and general osmosis. My project was to refine the argumentation for what I call presence – an affective sense of being-there and being-with in digital space which is incommensurably distinct from ‘visibility’ and other traditionally indexical markers of intimacy and connection. On one hand, this involves distinguishing the affective ‘feeling-feeling’ of presence; that is, the feeling of feeling connected which can persist independently of bodily proximity, visibility, and other auxiliary indicators. It is a question of understanding how we sense the presence of human others (for instance, on the Twitterscape) as well as larger, abstract entities (‘the surveillance society’). On the other hand, it involves plugging affect back into its contexts of social parametrisation, including the role of the technological object environment in modulating our ‘intuitions’ about how the world ‘must be working’ beyond our phenomenological purview. For more, see excerpts from the full essay, ‘Visibility and Presence: Speculative Anonymity and Affective Alienation in Digital Space’, currently in review. 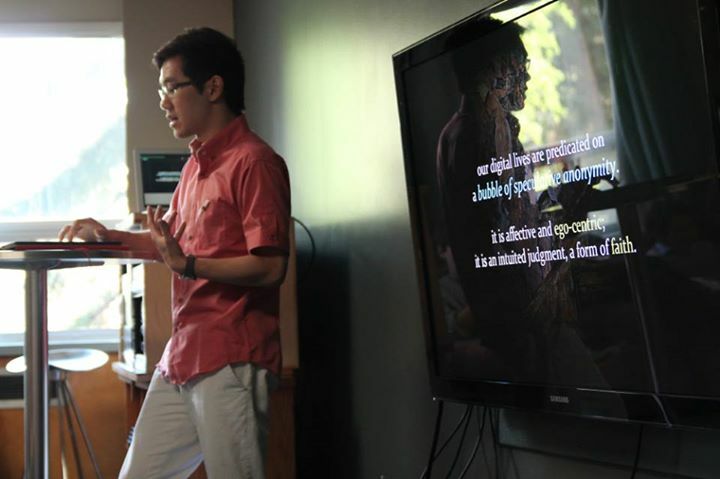 The program also included public talks and seminars by Lauren Berlant and Wendy Chun. With Lauren Berlant, we discussed issues such as recessive modes of expressivity, including the ‘deadpan’ (exemplified in Steve McQueen’s Deadpan) or reticent silence. In contrast to ‘melodramatic’ forms of self-expression, which tend to be intense, performative, and thus openly flaunt their intentionality, recessive forms tend to work precisely by concealing something of that which one expresses. (The deadpan, of course, can shift meaning wildly depending on the context; if you talk to The Man, he’s always deadpan, but that is quite distinct from a precarious and vulnerable subject’s deadpan in the face of authority or conflict.) This is no Levinasian excess. Rather, it is a kind of Bartlebyan response: “since I feel I cannot speak adequately or make you understand, I shall present my incommensurability.” A similar mode is identifiable in Saba Mahmood’s ethnographic study of Egyptian women. Mahmood suggested that the women’s valuation and practice of shyness regarding the veil and ‘endurance’ regarding their husbands (as opposed to passionate resistance and protest) was also a form of sovereign agency. This also tied into questions of how specific expressions and affective gestures become historically normalised and otherwise culturally significant (for instance, how America learned to smile in front of the camera in the late 19th century). Part of the work here was to run against the grain of categorising emotions and expressivity, and to recover from states of emotional vulnerability or disorganisation a sense of how such states nevertheless ‘work’. With Wendy Chun we spoke about the role of habit – a notion and activity which sits uneasily between pre-subjective influence and conscious or at least enacted behaviour, between automation and intention, the external and internal of the self. Habit is something we often ‘delegate to’, programming our own body and behaviour so that we gain, as Žižek would put it, a kind of ‘freedom’ in which to pursue other thoughts and actions. Yet habit is also the thing by which we recognise ourselves as ourselves – as if that which is most ‘natural’ is also what is most free from our intentions. Habit becomes a way of protecting ourselves from the transformation of the world (my environment may change, but I maintain some continuity through the repetition of my own mode of being), and at the same time, something through which we transform the world around us (I encounter a new surface, but responding to it in habitual forms, I turn it into a table or desk that I have always known). Habit introduces a bevy of specific behavioural tendencies that in problematises affect-driven readings of phenomena. Mahmood, S. (2001) “Feminist Theory, Embodiment, and the Docile Agent: Some Reflections on the Egyptian Islamic Revival,” Cultural Anthropology 16(2): 202–36. Sheehan, T. (2014) “Looking Pleasant, Feeling White: The Social Politics of the Photographic Smile,” in Brown, E.H. and Phu, T. (eds), Feeling Photography. Pittsburgh: Duke University Press.